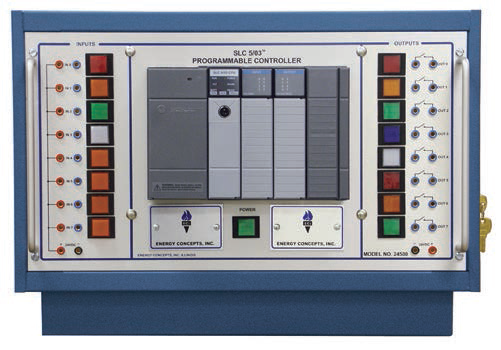 The SLC 5/03™ Programmable Logic Controller provides students with a 8000 instruction capacity CPU, a power supply, and five diagnostic indicators on the front of each processor. These diagnostic indicators show: Power, PC Run, CPU Fault, Forced I/O, and Battery Low. In addition, each Allen-Bradley SLC 503™ has LED indicators to show the status of each I/O point. 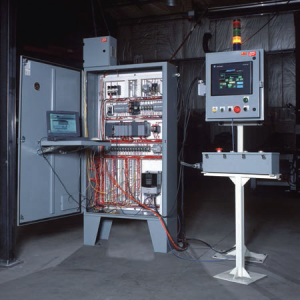 ECI’s competency-based courseware guides students through the RS Logix™ software where they create ladder logic diagrams to control standard types of industrial circuits. Design challenges and troubleshooting experiments are provided for students to develop practical skills and troubleshooting techniques. The ECI lab manual has an easy to read, two-color format, that shows professional illustrations, photos, and graphic representations of the programming screen. This technique provides students with the most dynamic, selfpaced software available. The lab manual’s 14 chapters present students with 53 hands-on programming lessons, which directly correlate to the ECI 245 trainer. – A competency-based lab manual bound in a large easy to use ring binder. – Programmable from most IBM-compatible computers. – Built-in 24-volt DC power supply with front panel jacks.